Dubai: When former Rounders England captain Suzanne Stringer moved to Dubai five years ago, she was determined to get the sport she loved so dearly up and running among schools in the emirate. Today, she has done not just that but has also had the chance to measure how far the sport has progressed here, courtesy of bringing the Rounders England under-14 side over to Dubai for a week-long training stint which included practice matches against Wellington International School (WIS) in Al Sufouh and a Dubai All-Stars team. "It's been something I've wanted to do for a long time, and finally we've done it," said Stringer who works as a PE teacher at WIS. Watching the Rounders England under-14 side in training turned out to be a nostalgic experience for Stringer, whose own journey began at that very level. "I started with England as an under-14 and gradually climbed through the ranks. When I came to Dubai five years ago, I still had links with Rounders England," she said. "It's worked out nicely as they are currently on a mid-term holiday. They don't get to tour a lot as not many countries play rounders, so it's a good opportunity for them too." It's been virtually a one-woman show as Stringer's mission to help the sport grow in Dubai has seen her cover every role from scouting players to coaching them. In addition to that, she has also conducted courses for PE teachers in order to educate them about the rules of rounders, how the game is umpired and the tactics involved. "[Rounders] is really popular here. Latifa School hold a tournament every year. Then you have rounders leagues and other tournaments taking place within the Dubai Schools network," she said. "It is mainly an English sport but there are a lot of other nationalities playing it now as they have been exposed to it at their schools. The standard of the school league is really good." What leaves her with special satisfaction and pride is having assembled the Dubai All-Star side which faced their first big test against the England under-14 team last week. 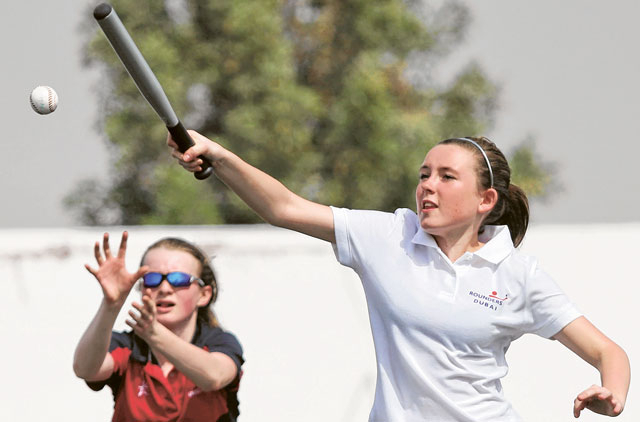 "I've found not just the best rounders players at Wellington, but hopefully the best rounders players in Dubai," she said. "We've been wanting to play more matches and I felt it's that time to take it a step further." And Stringer is eager to build on the foundation she has worked so tirelessly to lay in place. "I'd like to keep training with the team, improving their skills, even taking them to England to play matches there. "Anything is possible. I don't want to have done all this work for it to just fall apart," she said. Rounders is a striking and fielding game played between two teams which involves hitting a small, hard, leather-cased ball with a round wooden, plastic or metal bat and then running around four bases in order to score. A maximum of nine players are allowed to field at one time. Points or ‘rounders' are scored by the batting team by completing a circuit around the field through four bases or posts without being put ‘out'. The game is popular in the UK and Ireland for schoolchildren.